Problem: The Monomeros Colombo Venezolanos plant in Barranquilla, Colombia, jointly operated by the South American countries of Colombia and Venezuela, produces caprolactam for the textile industry and various chemical fertilizers for agricultural use. Recently agricultural plant capabilities were increased with the addition of process units to improve the production and quality of fertilizers. The new processing equipment improves plant flexibility by increasing the variety of fertilizer grades produced. In addition, the new equipment can bypass processing steps, if so required. The equipment includes a stirred-tank reactor that produces nitrophosphate solution from a mixture of phosphoric acid, nitric acid, and anhydrous liquid ammonia, and two pipe cross reactors which produce monoammonium phosphate (MAP) from phosphoric acid, sulfuric acid and ammonia. Neutralized solutions are pumped to the main process section for further conversion into nitrogen-phosphorus-potassium (NPK) fertilizers. The ability to produce monoammonium phosphate has many economical advantages; unfortunately, it also has resulted in an unexpected amount of NPK dust. Solution: Plant personnel decided to scrub the acids by circulating phosphoric acid in a wet venturi scrubber with a packed cyclone separator. Engineers worked together on the potential problems of the installation including the difficulty in handling phosphoric acid in a hot climate, and the clogging of the cyclone packing material by silica compounds. The venturi scrubber atomizes liquid which captures and removes fine particles. The scrubbing process starts with a high velocity gas stream atomizing a liquid stream. This high atomization and extreme turbulence removes even sub-micron dust particles. 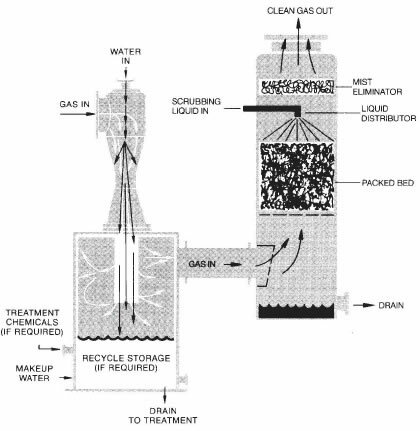 The atomized liquid and gas from the venturi section discharge into a cyclonic separator. The separator is 72″ in diameter by 24′ high and packed with a polypropylene material. The gas in the separator spins rapidly, and whirls the liquid particles to the outside of the vessel. The vapor condenses, runs down the wall, is collected and returned for recycling. Gases exit from a port in the top of the vessel. 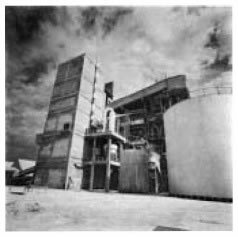 The scrubber-separator was designed to maintain an ammonia absorption rate of 95 percent of 110 kilograms/hour lost from the reactor. Fertilizer dust emissions were estimated to be about 20 kilograms/hour and were to be controlled by limiting particle size to a maximum of 0.20 grains/SCF. Results: In the months since its installation, the equipment has successfully processed 12,000 ACFM off-gas: 0.8 percent by volume of ammonia; and 28.0 grain/SCF dust; and has operated at 80°C. Clogging is avoided by holding solids concentration at 40 percent in a medium with a pH of 3.0. As a further anti-clogging measure and to provide abrasion protection for the pumps, a special overflow tank below the scrubber bottom is decanted and the solids removed. Fresh phosphoric acid is added as makeup while part of the circulating liquid is fed into the neutralizing reactor. Innovative Vacuum Systems For The Process Industries: The Clean Air Group’s continued growth reflects the confidence our customers have in our high vacuum systems and the recognized ability of our engineers to design innovative systems which satisfy the varied requirements of our customers in the process industries. Today, with the cost of energy increasing, these requirements include the need for high vacuum systems which operate efficiently as well as reliably. The Clean Air Group, LLC has responded to this need with the research and development of high efficiency ejector systems and the introduction of the energy efficient liquid ring vacuum pumps and combination ejector /liquid ring pump systems. If you are planning a new vacuum system or up-dating your present systems for more efficient operation, take advantage of our applications experience and expertise. Our engineers will be glad to spend the time required to carefully evaluate your process requirements and help you select a vacuum system which will provide dependable service at the lowest possible operating cost. Multi-Stage Ejectors: C-R ejector systems are the most reliable and versatile of all vacuum producing devices. 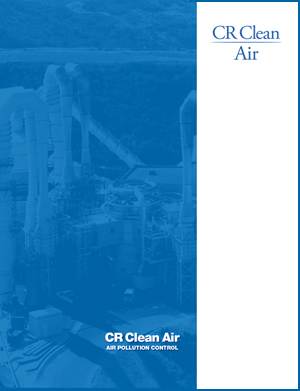 Used primarily for high vacuum service, C-R high efficiency systems are equipped with surface condensers to prevent contamination of cooling water and can be skid mounted for compact, low level installation. Liquid Ring Vacuum Pumps: Available in both single and two stage designs, the C-R liquid ring vacuum pump is ideal for processing applications requiring vacuum to 25 torr. The key advantage of the liquid ring vacuum pump versus other mechanical pumps is its simplicity. The pump has only one moving part and operates on a variety of sealant fluids which can be recovered and reused using closed loop recovery systems. Combination Ejector/Liquid Ring Systems: ROTAJECTOR systems incorporate single and two stage liquid ring vacuum pumps with multi-stage ejectors and condensing equipment. Designed to reduce utility consumption without sacrificing reliability, the ROTAJECTOR operates at the same suction pressures and capacities as multi-stage mechanical pumps, offering lower first cost and easy maintenance. Vacuum Refrigeration Systems: Used by the process industries world-wide to provide chilled water at temperatures ranging from 35r to 60°F. Key features are reliability, low first cost and minimum maintenance. The system shown here was installed at the Jari Florestal Pulp & Paper Plant in Brazil, the largest and most modern facility of its kind. Thermocompressors: Ejectors which are used to capture and recompress waste steam to a reusable pressure/temperature. Thermocompressors find their greatest application on multi-effect evaporators where they are used to recycle steam from the final effect to the first effect. Available in single nozzle, multi-nozzle and variable nozzle design.